I was having trouble finding a cheap way to make a nice pond that would last but look realistic, and not be a PVC liner with stones on it. I bought a 13 foot long drop in pond liner from Universal Rocks in Dallas, Texas. It is super light and is modelled after the famous rocky spring formations in Drippping Springs, TX. They have a huge variety of ponds in different sizes and even low-end price ranges. Mine was purchased through one of their resellers, a dude in, I think Ohio, who sells off of his site Gardengnomesetc. He was super helpful on the phone and has a bunch of ponds set up in his yard as tests. I'm currently playing with an all-solar setup, and I have been super happy with this company as they custom cast the ponds per order and you can request color. 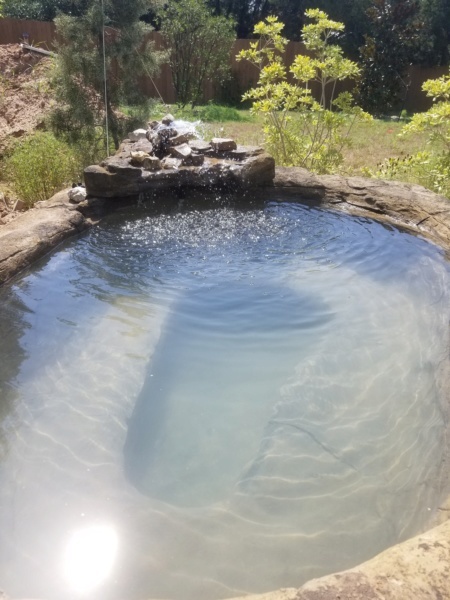 This pond I am currently landscaping (I just built the back of the hill today, so not in the photo) has a low area for adding mud and planting, or they can make it into a spa with jets. I'm using the deep area in the center for feet, and the shelf as a bench. Hold three comfortably. I am playing with the idea of a naturalistic area with this as a plunge pool feature and little mini ponds and streams around it. My goal is to have some surprise jumping water features to add some whimsy to the scene. After the years I got less time to build myself, so I found a very Decent and good quality seller from China. The company is Kepu Water. They sell alot of fountain stuff, and also Jumping Jets including cutter motor. I recently got 2 from them, and the quality is perfect.